The AceGrip Foam Latex Coated Gloves strike a balance between mechanical protection and comfort. Designed with a seamless red polyester liner, these gloves ensure hands stay both cool and comfortable. Additionally, the user is provided with good protection from cuts and abrasion and superb levels of grip in both wet and dry conditions, making these gloves ideal for general handling and light engineering applications. 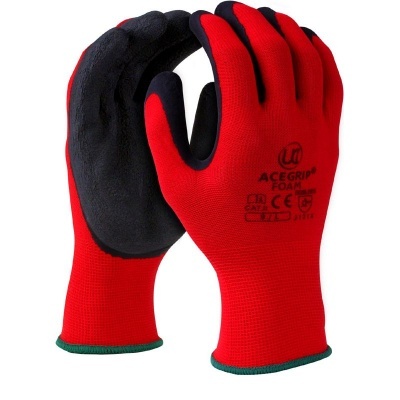 The AceGrip Latex Coated Gloves are available in five sizes that should suit the hands of most users. Please measure the circumference of your hand around the knuckles (excluding the thumb) with your hand open and your fingers together, and the length of your hand from the tip of your middle finger to your wrist.